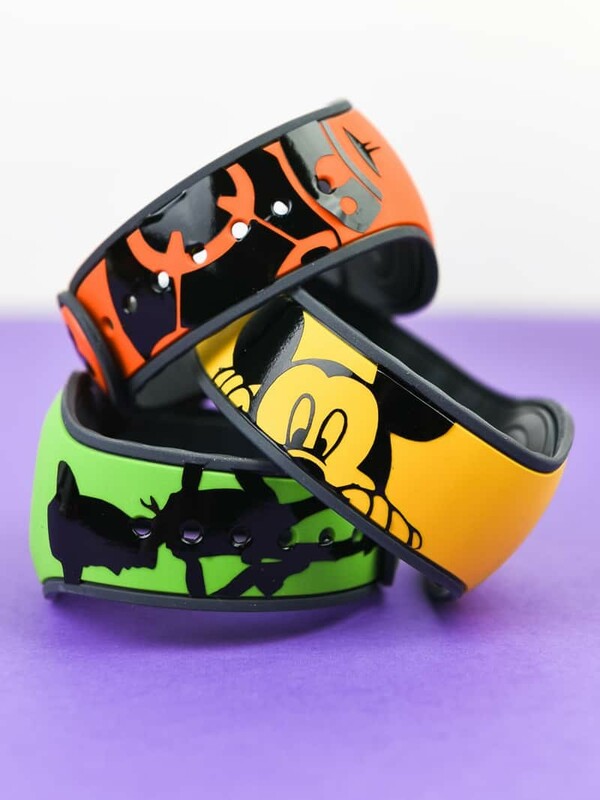 Get ready to show your Disney side with custom Disney Magic Bands! All you need is 20 minutes, a Silhouette Machine, and some vinyl. Trust me, you’ll end up with a new craft obsession and some truly nerdy wrist-wear. As if I really needed another obsession but…..I found one. Let’s just add magic bands to the ever-growing list of things you can put vinyl on. Because it’s such an awesome idea that I can’t believe I never thought to do it before now! The best thing is that you can pretty much do anything with your bands. Get them ready for Toy Story Land or just show your love for your favorite characters. They can be anything you want them to be! Over the weekend I was organizing my closet and found three untouched Magic Bands still in their box. We have so many of these things that they kind of show up at random times when we’re cleaning. They’re everywhere. Most crafters fear glitter everywhere, I fear my house getting overrun with magic bands. It’s totally possible y’all. We have a lot of them. Which actually works out in my favor because now I can vinyl all the things! With so many Disney characters there are hundreds of possibilities. Decorating them my never get old. 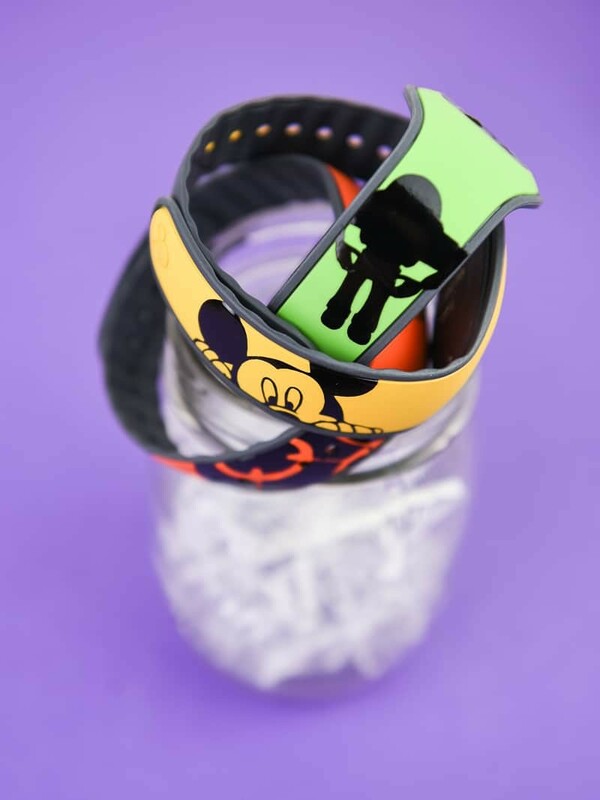 Why customize your Disney magic bands with vinyl? It’s a fun way to use up vinyl scraps! I cut lots of vinyl and always have small pieces laying around that I never know what to do with. Making small decals for my magic bands is a really easy way to get rid of those scraps and create something cute with it! This is a cost effective way to create something fun and unique for your next Disney vacation. It’s a fun project for kids to help with! I love getting my toddler involved in projects (if I can) and having him decide what characters to put on his magic band is really fun for him. It also gets him excited to wear it AND hypes him up for the vacation. If you have older kids they can weed and apply the design to the magic bands as well. The other great part about this craft is that it takes 20 minutes to do. And you know how much I love those quick and easy crafts! 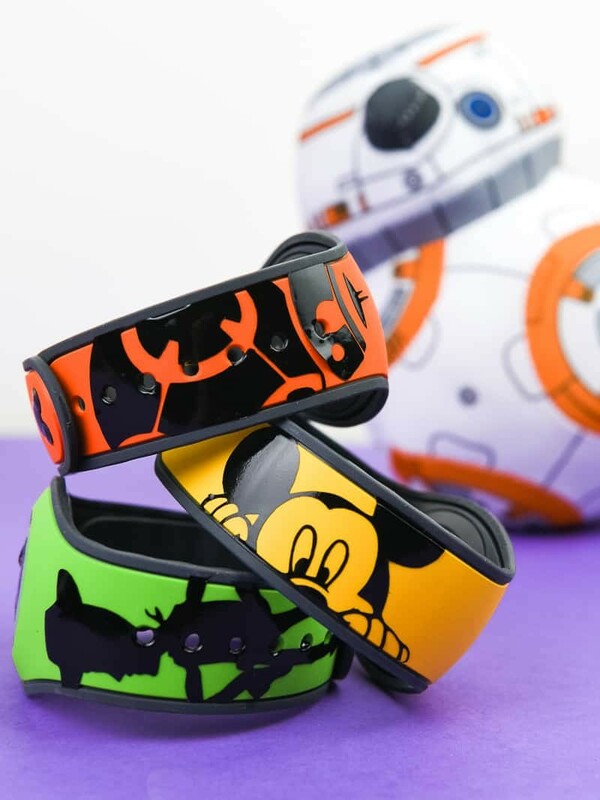 Are you ready to decorate your Disney Magic Bands with Vinyl? Customize your Disney Magic Bands with vinyl just in time for your next Disney vacation! Download the Disney Magic Bands Template and open it in your Silhouette Software. Find the designs you want to use for your magic bands (I found mine in the Be Our Guest Facebook group) and open them up in your software. Resize the images until you are happy with how they look and hit cut. Weed your designs and then use transfer tape to pick them up and put them on your magic bands. If your vinyl is having trouble sticking to the band, you may need to blast it with some heat. Use a hairdryer (on a low setting) to heat up your vinyl and use your fingers to "push" the vinyl onto the magic band. Let your magic band sit for a week before use. Before doing anything, clean your magic bands with rubbing alcohol. This will help the vinyl stick to the band! If you have any questions (or need further clarification), I made a video that will walk you through cutting your vinyl designs! If you have a hard time cutting and weeding small designs, check out this post! There are tons of tips on how to successfully cut and weed smaller pieces that you need if you’re tired of wasting vinyl. But it’s so simple. Even with the little hiccups I had the project was fun and easy. And you know what? If you mess up or get bubbles in the vinyl you can easily move it and fix it. Just be careful with small pieces. That’s actually the real reason Mickey only has three fingers on one of his hands! Make even more Disney stuff before your next trip! Hi Renee. Are you asking for how big the template (band) is in the software? If so, it’s 7.856 x 1.334. You should be able to use the template included in the post (if you click on it there’s a png, svg, and dxf file to chose from). If you need a different type of file please let me know! Hey there! I’m having a hard time getting the download link to work. The website keeps saying it won’t load. Do you happen to have another link for the template? The new link you sent worked perfectly. Thanks so much! The Facebook group does not appear to be valid any longer. Is there another location to locate designs? Unfortunately they set the group to private a few weeks ago and are not accepting new members. I’m part of another group called Disney Friends and Super Hero SVG’s that you could check out! I used permanent vinyl (oracle 651)! You may have to heat the vinyl with a hairdryer to get it to stick as well. And sometimes it takes a little bit of time and elbow grease. Thanks so much for the template. I have a cricut and when I upload the file in comes in very small. When I ungroup and am able to select just a magic band, what should the dimensions be? Hi Kathy! I just downloaded the Cricut software so I could try to figure out what’s happening with the file! I’m not sure why it is so small but each individual magic band should be 7.857 inches tall and 1.334 inches wide.